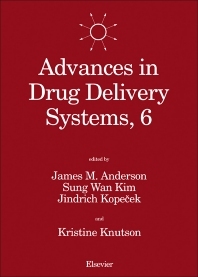 Advances in Drug Delivery Systems, 6 focuses on the progress in drug delivery systems as manifested in the fields of international pharmaceutics, polymer science, biotechnology, molecular biology, and cell biology. The selection first tackles biologically engineered microstructures and approaches to targeting bioactive compounds. Discussions focus on therapeutic efficiency of fatty acylated antiviral antibodies; effect of artificial fatty acylation on protein binding and uptake; and controlled release of proteins from lipid microcylinders. The text then elaborates on mucosal delivery of macromolecules and targeted delivery of diagnostic agents by surface-modified liposomes. The book examines the factors on in vitro micelle stability of adriamycin-block copolymer conjugates; vaginal and reproductive system treatments using a bioadhesive polymer; and control of the disposition profiles of proteins in the kidney via chemical modification. The publication also takes a look at drug delivery using biodegradable microspheres; approaches to improved antibody- and peptide-mediated targeting for imaging and therapy of cancer; and biodegradable microspheres for the delivery of oral vaccines. The selection is a valuable source material for scientists and readers interested in the advances in the systems of drug delivery. Lipid Nano-Sphere (LNS), a Protein-Free Analogue of Lipoproteins, as a Novel Drug Carrier for Parenteral Administration, IV.